It’s been about a year and a half since I first swung a leg over my 2011 FXDF Fat Bob, and six thousand miles in the saddle have shown me the decision to finally walk into Chandler Harley Davidson and buy the almost eight hundred pound beast was the right one. It had been a long road to motorcycle ownership for me, now a third generation Harley Davidson owner, since accidents both my Grandfather and then later, Father were involved in, had kept me on four wheels through my young adult life. My younger brother Craig, family rebel, hadn’t paid as much attention, and owned bikes since he was a teenager. When he passed away in the summer of 2012, parked outside his house was a 1992 Heritage Softail Classic. My brother wanted his Harley to go to his best friend, the first person he met when we moved to Arizona in the late 70s, and so my father and I arranged it. Packing up his possessions, I came across a stack of HOG magazines, and a well-worn 2012 Trip Planning Guide he had clearly spent time with. I was sorry that his rapidly declining health had prevented him from using the guide as it was intended, and a couple days later, sitting in a coffee shop reading about HOG, I made a decision. I always joked that when I was young, I had a mother who prevented me from riding a motorcycle. When I was older, the mother held less sway over those decisions, but I didn’t have the extra money necessary to buy a bike. By the time I had the money, I had picked up a wife, who took over from Mom in keeping me out of the saddle. My wife, a wise and understanding woman, recognized there was something different this time in my musings about buying a bike, and didn’t object when I took a rider’s course to get my motorcycle endorsement on my driver’s license. As I shopped the Harley-Davidson line, both at the dealership and online, she and I both had our separate revelations. She realized I was serious about motorcycles this time, and I came to understand that I wasn’t looking for just a motorcycle, I was looking for my Harley. The rider’s course was excellent, and though I’d never ridden a full-sized motorcycle, just made a few laps around an empty lot on a cousin’s Honda Trail 70 when I was 13 or so, I came away from the two-day course with a good understanding of basic ridership, and a healthy respect for all that can go wrong in riding big, heavy machines in traffic with bigger, heavier vehicles driven by less-skilled operators who weren’t always paying a lot of attention. The mechanics of riding seemed natural to me, and presented no great challenge. The instructor taught in a way that gave us just enough of a peek into the physics of riding a motorcycle that I was inspired to study those aspects of riding more fully. As a result, I believe I’ve learned to ride much more safely than if I’d just picked it up myself, and that comes with an understanding that the learning should never end. It’s made me a better “cage” driver, too, since I’m much more in tune with what the other cars around me are doing, and even more importantly, what they may be getting ready to do. After getting the required “M” endorsement on my Arizona Driver’s License, I began shopping in earnest, quickly eschewing the advice to “buy a Japanese 750cc bike and ride it for a year or so, then trade it in on a Harley.” After looking at all the possible combinations, I settled on a new, light blue 2011 FXDF Fat Bob, negotiating a color change to “Black Denim,” and contracting with the incredibly talented Matt Andrews of Hypnotic Air to do some custom paint on the tank. 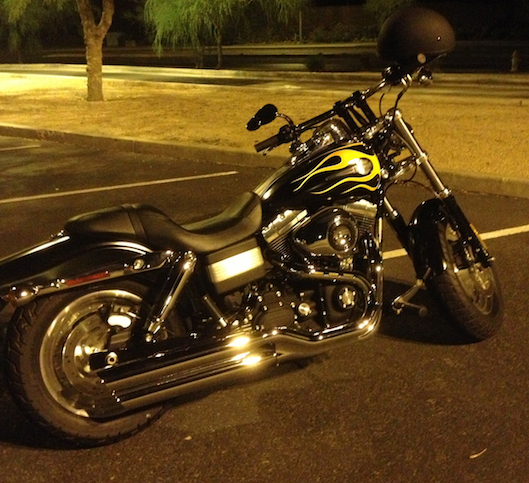 The result was stunning, and I had my first Harley. Early, EARLY morning rides got a safe start, and as I felt more comfortable, I began riding in heavier traffic, and then on the interstate. The Fat Bob may not be a bagger, but it’s a stable platform that with a windshield and some mini-floorboards, makes for pretty comfortable medium range transportation. As I rode to breakfast today, on a cool, bright Saturday morning, I marveled, as I often do, that even though I just started doing this a year ago in August, my FXDF makes me feel like I’ve been riding all my life. While it sometimes makes me regret not learning to ride a lot sooner, when I could have ridden with Craig, it also hits me that maybe the free, natural feeling I have when doing this is partly because he’s here with me, knowing his best buddy has his Heritage Softail Classic, and happy his big brother finally wised up and got on two wheels.